A particularly powerful medicinal honey, intended for alleviation and treatment of pains and infections in the upper respiratory airways; this honey acts as a natural antibiotic. Directions of Use: Gradual sucking of one spoonful, twice a day; eating and drinking is permitted only 30 minutes after use. Ingredients: Salvia Off, Laurus Nobilis, Sambucus Nigra, Eucalyptus Glob, Plantago Major Matricaria recutita, Rosmarinus Off. 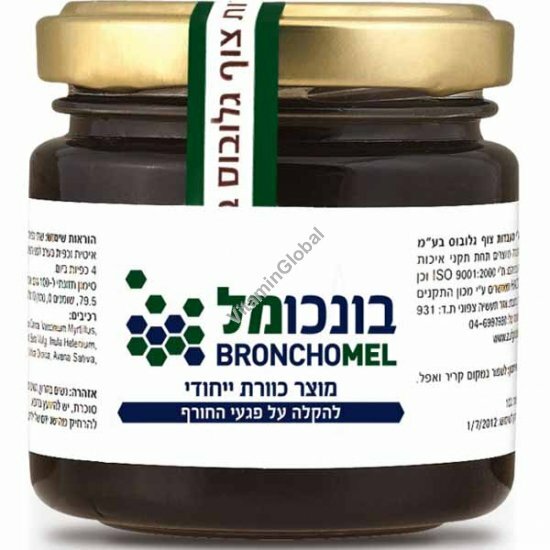 BronchoMel customers, please note that in rare cases you may receive one or more bottles with a small amount of honey leaking from the area of the seal around the cover. If this should happen, there is absolutely no problem. This phenomenon can happen because Life Mel is not vacuum packed, such that air pressure changes during international flights can force out a bit of honey, especially if a jar has more than the listed 120 grams. Being a natural antibiotic, there is no chance of the honey turning rancid, in or out of the bottle. Simply clean up the jar and use as per the directions. To be clear, there are no refunds or compensation for such minor leakage.